Flowers and floral arrangements are a common tradition respecting the deceased in many different cultures. Offered as bouquets, wreaths, or as part of larger displays, flowers add a touch of beauty and elegance to the setting, and also convey respect for the deceased. When funeral planning or preparing a gravesite for burial, flowers are likely to play an integral role in the proceedings, and they. However, funeral etiquette dictates that there is more to the process than simply placing a flower or bunch of flowers on a grave and leaving them there. In order to respect the deceased as well other families going through the grieving process, there are a few floral guidelines to consider. 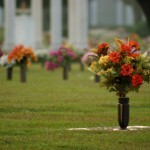 • Some cemeteries have rules about leaving flowers at the grave, which may restrict your options. For example, some prefer not to allow artificial flowers, while others may put a ban on leaving anything on gravesites in certain areas. Still others allow you to place live or potted flowers at the site, with the understanding that you will be responsible for the upkeep and disposal of the plant. 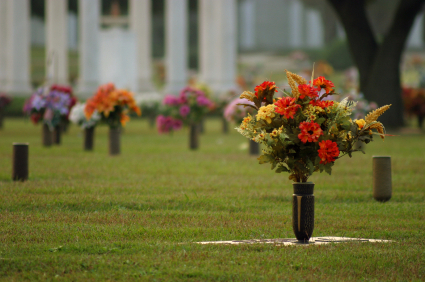 It’s always best to determine what type of cemetery your loved one will be resting in during the funeral planning process, especially if leaving flowers is important to you or the deceased. Most cemeteries are happy to be up front about their particular policies. • Some headstones come with vases or other vessels to leave flowers at the grave, or there may be options to have a vase installed at any time in the future. Because these are permanent structures, it can encourage you and other family members to bring flowers by regularly or to arrange artificial flowers in a way that suits you best. These vases can add a touch of elegance and personalization to the headstone, as well, which is nice if you’d like to distinguish the grave from others in the area. • Different flowers fare better than others in an outdoor setting. Cut flowers – no matter what kind – aren’t likely to stay blooming for longer than a week, and will have to be removed fairly soon after being placed. • No matter what type of flowers you leave at the grave, be sure and remove all paper, plastic, and other items that could blow away. Cemeteries are known for being beautiful and serene, and although most have a caretaker or team of caretakers, you should do your part to respect the area. • Flowers can be expensive, and if green funeral planning is on your mind, it’s also important to note that more elaborate displays require quite a bit of cultivation and travel before they reach your hands. Only give as much as you are comfortable with, and always remember that the sentiment behind leaving flowers is more important than the tangible benefits. As a tradition, leaving flowers at the gravesite is one that is largely inoffensive and can appeal to individuals from a variety of backgrounds. If you choose to honor your loved ones with flowers, do it with care and with the understanding that flowers don’t last forever and must be tended from time to time.